CnetSDK .NET PDF to Image Converter SDK is a top-notch PDF converter library component for C#.NET projects. It can be used to render, transform, and convert PDF to various raster images, such as converting PDF to JPEG/JPG, TIFF, GIF, BMP, PNG, etc. Mature .NET APIs and methods for PDF to image conversion can be applied to your Visual C#.NET programming. Detailed C# sample codes for rendering and converting PDF to images are offered on this page. In the free trial package, .NET PDF converter for images library is placed based on your Windows System (x86 & x64) and .NET Frameworks version (2.0 to 4.5). So, please choose the suitable .NET PDF converter library component for your Visual C# programming. Then, you may simply add the CnetSDK.PDFtoImage.Converter.Trial.dll to your C#.NET project reference to integrate and use all PDF to image converter functions. Please Note: a watermark ("www.cnetsdk.com") will be shown on each converted image file randomly if you are using the free trial package of CnetSDK .NET PDF to Image Converter SDK. The following C#.NET APIs and methods can help you convert PDF to images for C#.NET applications. In details, you can easily load a PDF document from a file stream, memory stream or local file on your disk, and then convert the whole PDF file, one PDF page, or a range of PDF pages to raster image file(s). Moreover, image size (width and height) can be customized. // Load a PDF to C# project from a file stream or memory stream. // Load a PDF to C# project from a local file. // Convert specified page(s) of PDF to image(s) in Visual C# project. // With current DPI value, the converted image size is original size of PDF page. 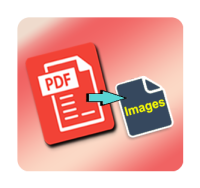 // Convert specified page(s) of PDF to image(s) with defined image size. // Width and height will be changed with different DPI values. In this section, you will see several pieces of Visual C# sample codes for rendering and converting PDF document to image files. And we only take the JPEG image file format as an example in the last two C# demo code. To convert PDF to other image formats in your C#.NET project, please directly change the image format to a specific one. Please see details as below. For your reference, we provide an online tutorial for ASP.NET web application PDF to image converting. Please see: How to render & convert PDF to images in ASP.NET web project. Besides, we provide VB.NET programming example for converting PDF document to image files. You may use these words when you want to find a c# convert pdf to image free library for your applications development, such as using convert pdf to image c#, convert pdf to image free c#, pdf convert to image c#, c# .net pdf to jpg and so on. Now, we hope you can recommend CnetSDK to others next time if you have tried our SDK and successfully achieve pdf convert to image jpg and render pdf to images in c#.